Robert Walls was born at Colac, Victoria and educated at country schools before joining the Royal Australian Navy College (HMAS Cerberus) as a Cadet Midshipman in the last 13-year old entry, in January 1955. During the course of his training the Naval College relocated from Cerberus back to its original site at Jervis Bay, commissioning as HMAS Creswell in February 1958. Following graduation Walls served at sea for several months, visiting New Zealand in the Grimsby class sloop HMAS Swan (II) which at that time was performing the role of an RAN training ship. In April 1959 he left Australian shores to join the Britannia Royal Naval College (BRNC), Dartmouth, UK for continuation training. The following month he was appointed Midshipman. Midshipman Walls found the environment at Dartmouth much to his liking, enjoying his time both at BRNC, and in the Type 15 fast anti-submarine frigate HMS Vigilant, operating in the West Indies, as part of the Dartmouth training squadron. On 1 September 1960 he was promoted Acting Sub-Lieutenant, and returned to Australia. Continuation training in HMA Ships Melbourne and Quiberon followed before undertaking the ‘Destroyer Gunnery Officer’s’ course at HMAS Cerberus in May 1962. On completion Walls joined the fast anti-submarine frigate Quickmatch for gunnery duties, having been confirmed in the rank of sub-lieutenant. Promoted Lieutenant on 1 February 1963 he joined HMAS Cerberus the following May and undertook a Type 12 frigate training course before joining HMAS Derwent as commissioning crew in 1964. He remained in Derwent until mid-1965 during which time he saw service in waters off Borneo and Malaysia during the ‘Indonesian Confrontation’. 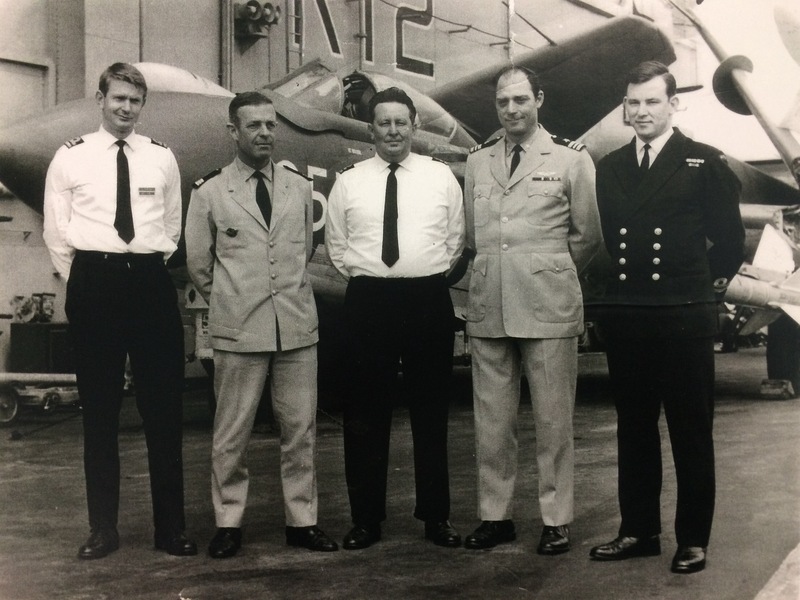 After completing an Operations Room Officer’s Course at HMAS Watson, Lieutenant Walls travelled to the US in November 1965 for training, and to join the commissioning crew of the newly-built Charles F Adams, DDG-2, class guided missile destroyer HMAS Hobart (II). Walls served in Hobart during the destroyer’s first deployment to the Vietnam War between March and September 1967, for which her crew was awarded a United States Navy Unit Commendation for meritorious service. While in Vietnam he also served in USS Kittyhawk, CVA-63, and USS Long Beach, CGN-9, as an Air Intercept Controller. The then Lieutenant R Walls (at right) while serving in HMS Hermes. Other RAN officers include: Lieutenant J McDonald (left) and Lieutenant K Clements. 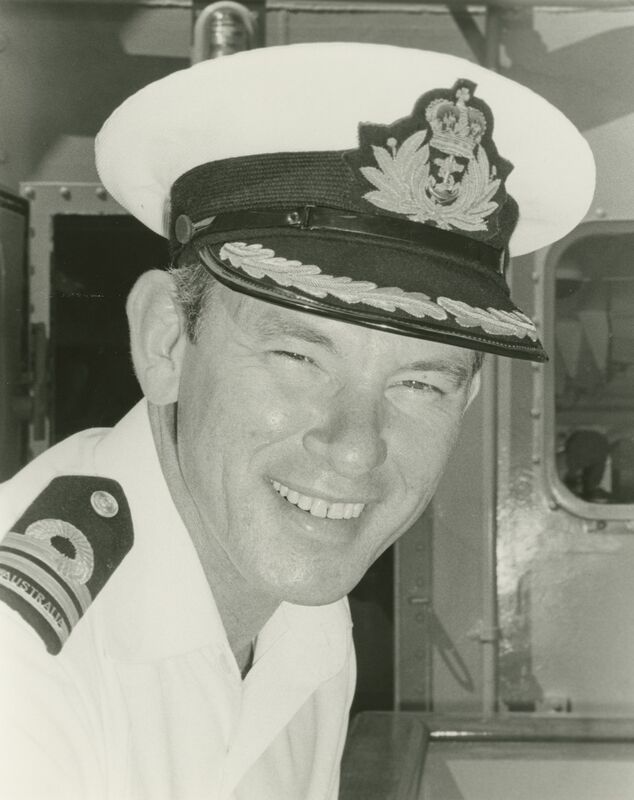 Promoted Lieutenant-Commander on 1 February 1971 in the UK, he returned to Australia and to sea in HMAS Perth (II) as the ship’s Direction Officer, before joining the ND School at HMAS Watson in January 1973 as Training Officer. 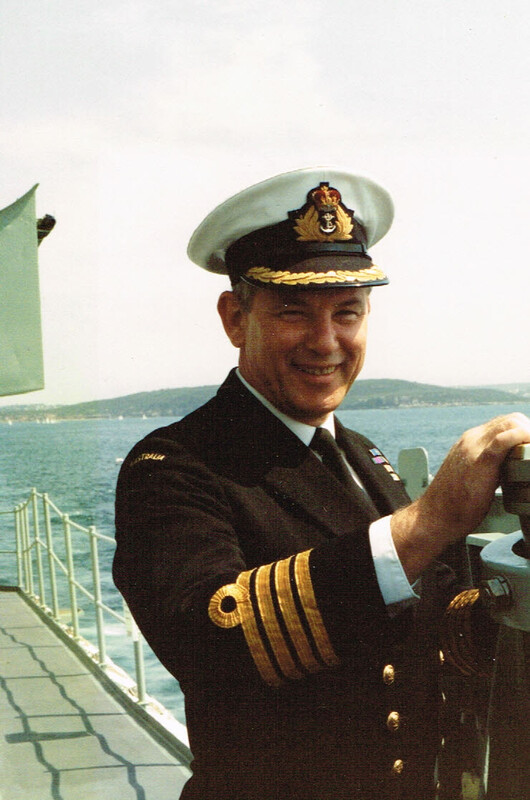 His next appointment was on the staff of the Flag Officer Commanding the Australian Fleet (FOCAF), as Fleet Direction Officer from 1975 - 1976, a position he held until appointed executive officer of HMAS Perth (II) in January 1977. He was promoted commander on 30 June 1977. On 16 February 1978 Walls was appointed to Navy Office in the Operational Requirements Branch - Navy, as the Follow-On Destroyer Project Officer. On 22 December 1981 Commander Walls assumed command of the RAN’s heavy lift ship HMAS Tobruk (II). This was to prove a rewarding appointment with one of Tobruk’s first operational missions being to transport eight UH-1H helicopters and eight RAAF ISO containers to Israel in support of a United Nations sponsored Multi-National Force operating in the Sinai Desert. He remained in command of Tobruk until 23 June 1983 at which time he was appointed Commander Australian Amphibious Squadron (COMAUSPHIBRON) and commanding officer of the shore establishment HMAS Moreton, situated on the Brisbane River. Promoted Captain on 30 June 1984 his next appointment was as the Director of Naval Force Development in Navy Office, Canberra. In recognition of his achievements in this posting he was made a Member of the Order of Australia in June 1987. Command of HMAS Brisbane followed on 10 June 1987 following completion of her extensive half-life modernisation. This command capped off service at sea in all three of the RAN’s guided missile destroyers, and Walls later described it as the most enjoyable posting of his naval career of 42 years. Walls was promoted Commodore on 30 June 1988 before attending the National Defence College, New Delhi, India in 1989. Returning to Australia the following year he was promoted Rear Admiral on 30 June 1990. Appointments as Director General, Naval Policy and Maritime Doctrine (1990), Deputy Chief of Naval Staff (1991) and Maritime Commander (7 November 1991-7 December 1993) followed. He was appointed an Officer of the Order of Australia in January 1992, following the Gulf War of 1991. His service as Fleet Commander included participation in RIMPAC ’92 as Battle Force Commander of USN, USAF, Canadian, Korean, and Australian Task Groups. 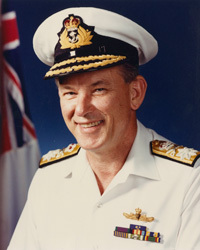 In 1994-1995 Rear Admiral Walls served as the Assistant Chief of the Defence Force for Capability Development. Walls was promoted to Vice Admiral and appointed Vice Chief of the Australian Defence Force on 20 April 1995. Vice Admiral Walls retired from uniformed service in March 1997. He subsequently pursued a business career in defence industry, focussing on strategic and risk counselling, and consulting. He was chairman, director, or advisor to a number of Australian and foreign companies, including Science Applications International Corporation (USA), Price Waterhouse Coopers, Thales Underwater Systems, Bell Helicopter, Australian Defence Industries/Thales, and CEA Technologies. He was appointed a Chevalier of the Order of National Merit of France in 2002. His later activities included being a member of the Advisory Council for the Strategic and Defence Studies Centre at the Australian National University, and of the Australian Committee for Security and Cooperation for Asia and the Pacific. Vice Admiral Walls also mentored and advised in defence industry. [i] The primary role of a Direction Officer afloat was the control and direction of fighter aircraft and the provision of advice concerning tactics and coordination with other anti-air warfare systems.